Comments: The vintage Emperor's Royal Guard is the textbook example on how to make a figure of this character. Considering how well conceived this figure was, it is mind boggling to think how wrong the two modern remakes truly are. There is little doubt that if the Saga line offered an exact reproduction of this figure, it would be hotter than Georgia asphalt! 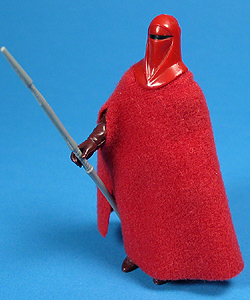 Major Variations: Though all vintage figures have minor variations, the Emperor's Royal Guard has no major variations. It is important to note that for the images used to show the Royal Guard without the cloaks, a figure had to be permanently affected. Even though they were taken off without any noticeable damage, they are not meant to be removed and could destroy an otherwise perfect figure.